I never wanted to make a gun. seemed to be what everybody did. There were more Rifle and Deemer mods out there than you could count. Some were horrible, others were pretty good. Some were even great. Like the EXU weapons Waffnuffly was doing, and the stuff that one guy who used to hang out here was working on. What was his name? Ferilisomethingorother. Anyways, as a side effect of my FrickinShark project, I made a projectile that just needed to be in a gun. So I made a gun. If you liked drawing stuff on the walls with the UT PlasmaGun, you will like this. Offline, you can draw as many scorch decals as you can before they start fading due to the lifespan setting. Had it up to 1566 of them for 1 laser beam in testing at one point. 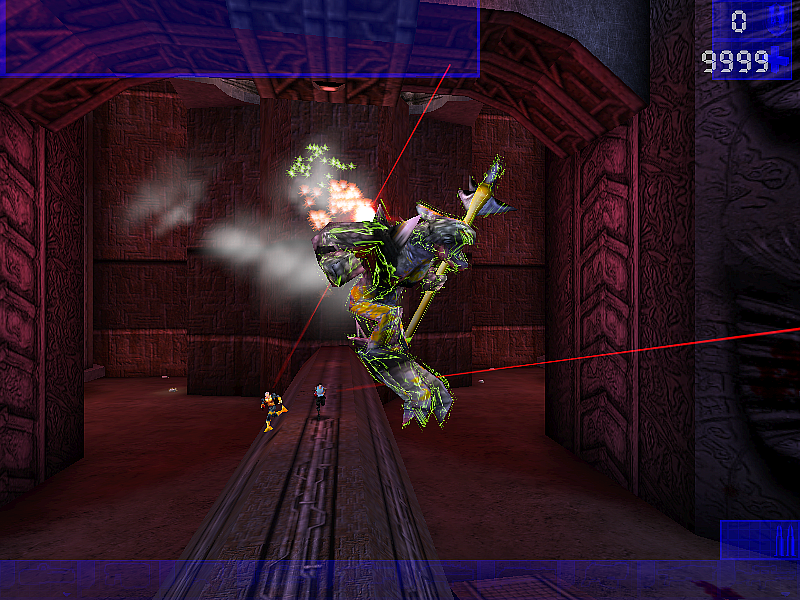 Online, it will restrict each beam to 32 decals, but just tap fire again and you can draw more. If the bot's aiming seems a bit off at times, this is on purpose. unchanged. If you take it out, or mess with it much, they either become incompetent, or aim-bots. Neither of which is good. while writing this. I wanted it to be as Unreal as possible, and also be hopefully unique. Look at the Readme.txt file. 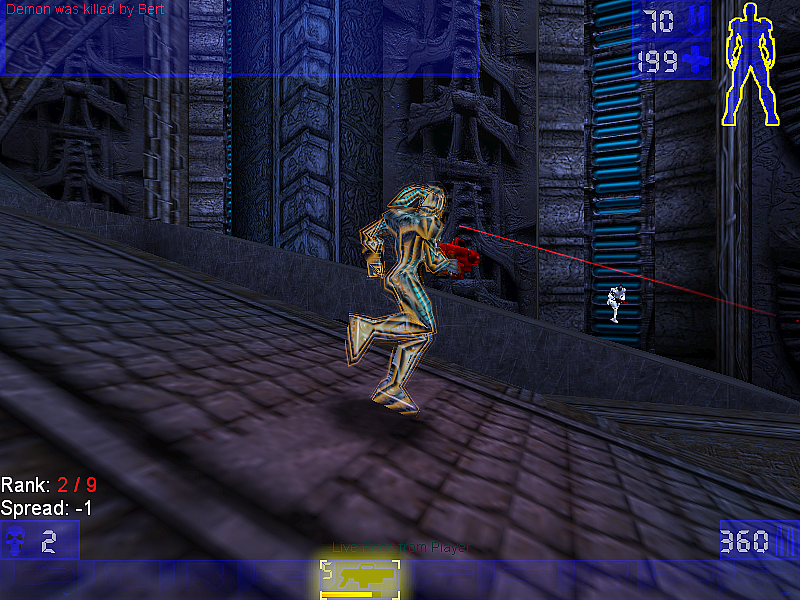 LaserArena mutator also included. Last edited by MrLoathsome on Sat Mar 10, 2018 2:22 am, edited 3 times in total. It's good to see a new weapon and this is a really nice addition to UT's weaponry - well done. Am currently experimenting with the two settings so it can be used as a powerful (but not too powerful) medium range weapon. Keep in mind there will be an RC2 update soon. RC1 has a glitch with the view if you have weapon hand set as Left. There is also an accessed=none error that only shows up online, which is not acceptable. Looking into tracking that down now. 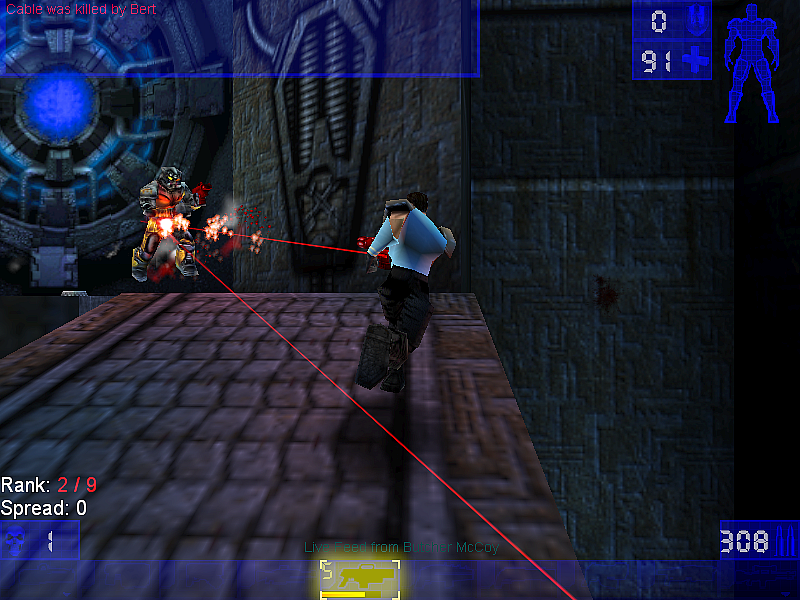 The LaserArena included with RC1 also fails to update the 2 variables when used online. It still works, but uses the default values. Time to cut down some monsters..
Do you need a skin for this? Downloaded this, haven't tried it yet. Thank you for not making it hot pink. EvilGrins wrote: Downloaded this, haven't tried it yet. My skin/model skills are not so good. Tweaking colors/textures a bit is about as far as I get. animations etc, I sure could try it out. *Edit. Remove caps from papercoffee's name. Ok ...I have already an idea for this skin. MrLoathsome wrote: *Edit. Remove caps from papercoffee's name. Maybe a darker red or a slightly used look red? It's like toy plastic airplane red there. 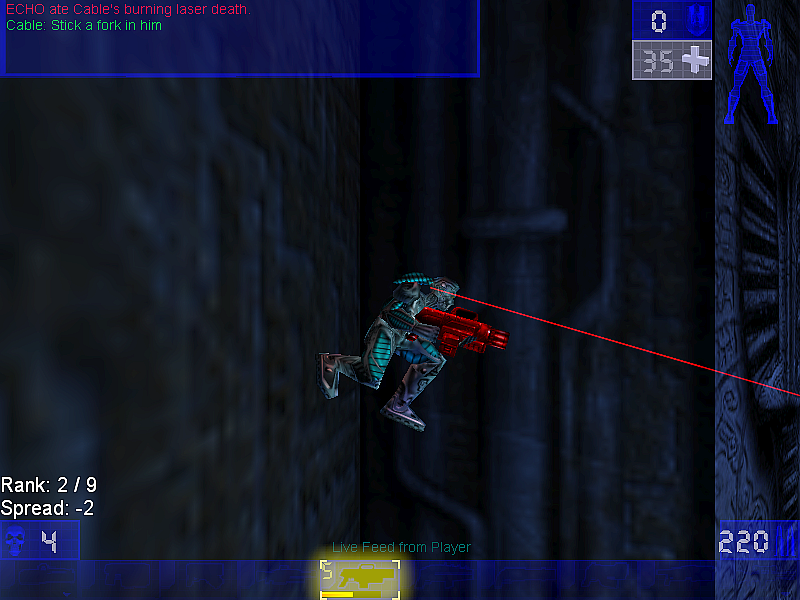 The lasers seem like sniper scope lasers, except they kill. Maybe it was the recent Star Wars film but I was kind of picturing a pulsed laser burst, multiple shots. ...but the regularity of the solid beam makes it seem a bit... I dunno, off. the PulseGun code. It does the same sort of thing, but it is not as obvious as it has that fatter plasma beam. hits a bit to the right and a bit low. If it is set for Left, beam hits a bit to the left and a bit low. If you set weapon hand to Hidden, it actually centers, but still hits a bit low. PulseGun does the same thing. It's very obvious when an SKtrooper or any Skaarj Military has it, because they hold all weapons in their left hand... but the beam still shows up on the right side of all models. That will be fixed with the RC2 release. I edited the default skin ...slightly. And I made it so that you still can use the default Pulse ammo Pick-up. If you want it changed I can do this. Was just baffled that the Pulse Rifle doesn't have a bigger 3rd-Person skin like the other weapons... yeah I'd never looked after it because this was the most uninteresting weapon for me till now. All I need is the nifty PCX files that maps onto the mesh(s). Re: Default Pulse Ammo Pickup option. Why? It has that same bright red color as the current gun does that EvilGrins likes so much. 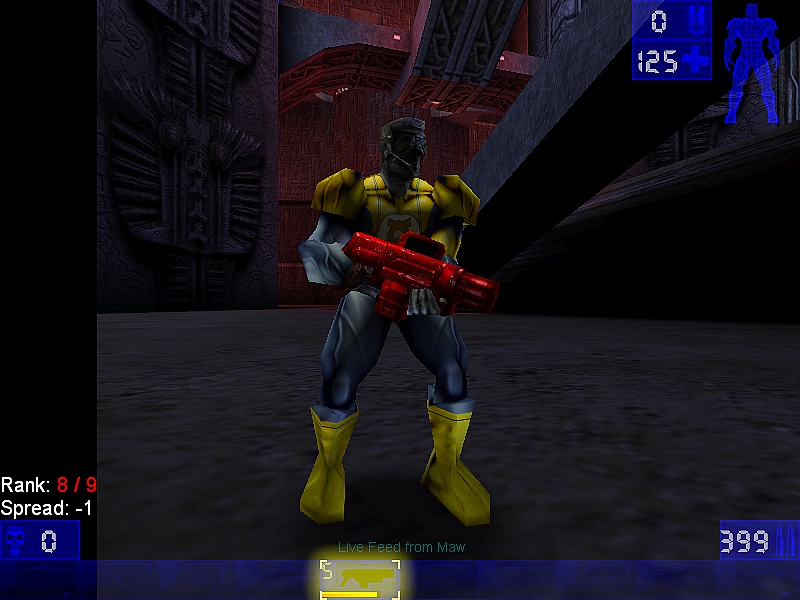 Hell, I might add an option for skin selection to the thing so either could be used for both the gun and the ammo pickups. And really nobody should be making code changes to a Beta or RC version of something. I ain't mad or nothing. Just don't want you wasting your time. ammo and the Pulse ammo. Easily done, although I would still ask Why? MrLoathsome wrote: I would still ask Why? I don't really know what my intention was ...maybe to be able and use both in one map and have only one ammo like the enforcer and Mini-Gun. Anyway ...I had too much fun to edit the ammo pick-up as well. Here are the newest versions of this skins. Do you want the pcx files or the utx?